This is the ultimate apple pie! No too sweet... but packed with delicious apple-y goodness! 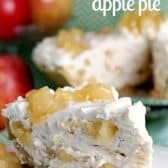 This easy no bake pie is guaranteed to be a huge hit! Place 1/3 cup cold apple juice in a bowl. Sprinkle with gelatin powder and let sit 3 minutes. Bring remaining 2/3 cup apple juice to a boil. Add to gelatin mixture and stir until dissolved. Place in the freezer for 15-20 minutes or just until cooled and slightly thickened. Meanwhile, with mixer on medium-high, beat 1 1/2 cups heavy cream until stiff peaks form. Add sugar and cinnamon and beat just until combined. Pour cooled & slightly thickened apple juice mixture into the cream and whisk until combined. Chop the can of apple pie filling. Set aside 1/2 cup & fold the remaining chopped filling into the cream mixture. Place the cream mixture in the fridge for about 15 minutes or until slightly thickened. Pour/spoon into pie crust and let set 2 hours or overnight. Whip remaining cream on medium high until stiff peaks form. Add sugar & vanilla. 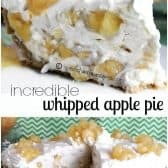 Garnish pie with whipped cream and remaining apple pie filling.